Essentially an African-American reinterpretation of the classic Airplane! films, this directorial debut for music video mogul Terrero is as good as can be expected. Utilising the joke-a-minute comedy style of the movie's obvious influences, and combining them with a clearly urban theme, Soul Plane creates an interesting mix that work fairly well for the most part. The story's premise is a simple one that allows for the suspended disbelief that is necessary when watching a film of this nature: Nashawn Wade, a young black man, wins a ton of money in a landmark settlement with an airline and decides to use the money to start up his own urban airline. Named after its owner, Nawshawn Wade Airlines (or NWA) loads from Terminal (Malcolm) X, with the movie focusing on the airline's inaugural flight. 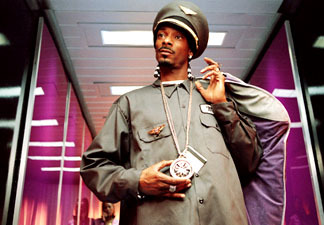 With an unqualified Captain (played by Snoop Dogg), a pair of obnoxious female security attendants and a token out of place white family, the purple and chrome planes take to the skies. While most of the jokes are obvious (the flight number is 0-69), there a few genuinely clever laughs buried in the film. The plane features a "Low Class" section, where passengers are crammed together, overhead compartments are lockers that require a quarter to open and the in-flight meal is Popeye chicken that must be shared by all.